Rather than cover the bottom of the bag as they do on the Pyramid Satchel, Melie Bianco keep the studs on the side here. They're paired with delicate pinhead studs, which add a little femininity. This restrained detail makes the purse look much classier than its counterpart, especially in this conservative gray. That should see it look good long after the current taste for studs is over. For just $84, it's no surprise that this isn't a real leather purse. But it doesn't do a bad imitation, with a little distressing helping to recreate an authentic leather look. It slouches in all the right places too, which should please hobo fans. Slouchy purses can be difficult to use, but the flat base of this Melie Bianco bag gives it some extra structure. It will help it sit up when you set it down, making it easy to get your essentials in and out. This gray color is a timeless shade but if you're after something bolder, consider this Melie Bianco in red. 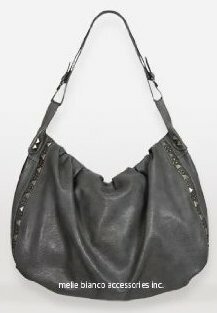 The Melie Bianco Pyramid Studded tote bag, a great alternative to this hobo bag.